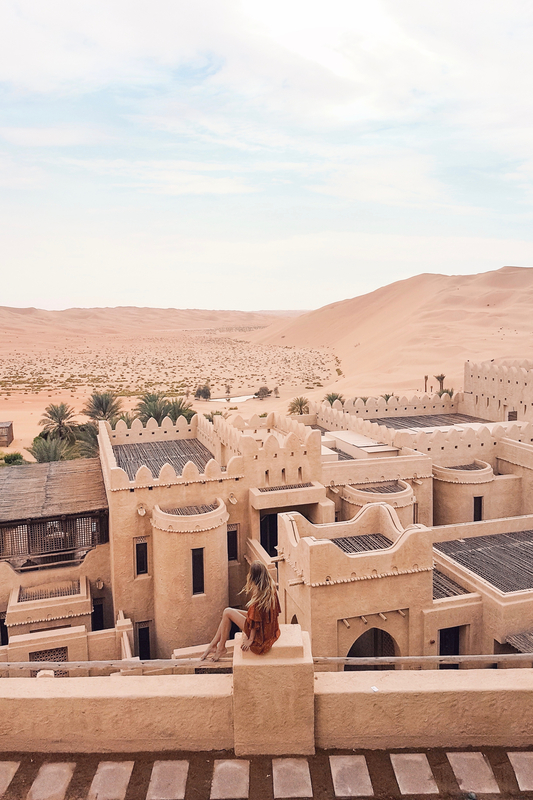 Hi guys, welcome to my updated Abu Dhabi travel guide. 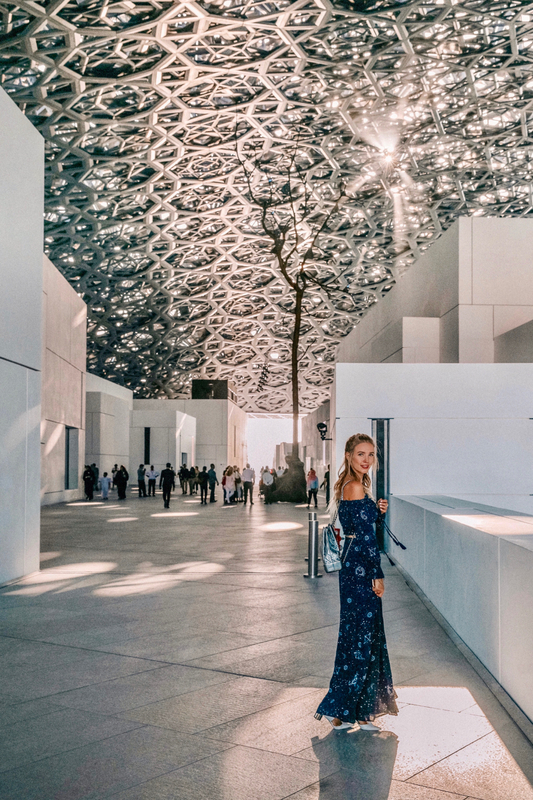 After being in Abu Dhabi with Abu Dhabi Tourism earlier the year, I had the honor to return only half a year later to visit this beautiful place again for the opening of the stunning Louvre Abu Dhabi. And honestly: it’s been one of my favorite projects in 2017! 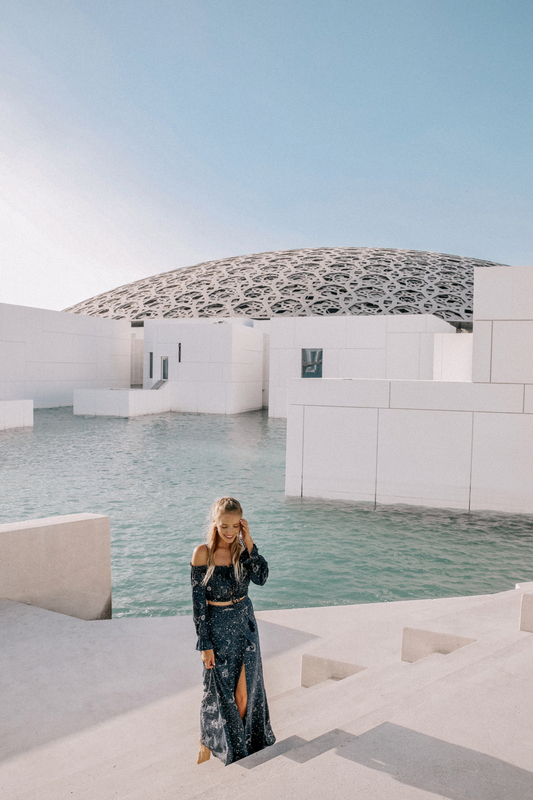 As Alex and I came back to Abu Dhabi for the third time, we already knew everything quite well and enjoyed the mixture of discovering new sights and going back to places we loved during our previous visits. 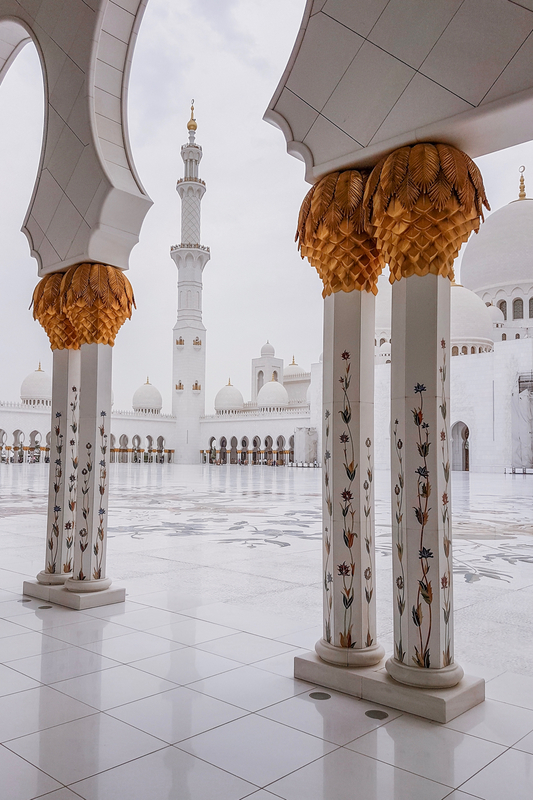 The Sheikh Zayed Grand Mosque is the biggest one in the United Arab Emirates and was opened in 2007. I personally think it is one of the most beautiful buildings I ever got to visit! With its numerous columns and domes, the reflection pools and all of the colorfully ornamented white marble you could wander around it forever. We had a young woman as our personal cultural guide, which was amazing because she could give us a lot of details about the mosque’s architecture and design but also about the worshipping that takes place within its walls. 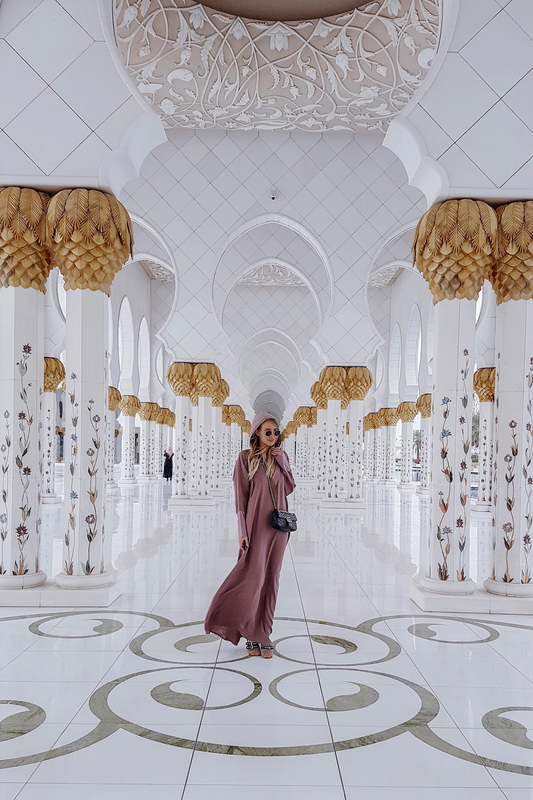 If you ever come to Abu Dhabi, the Sheikh Zayed Grand Mosque should definitely be on top of your of things to see list! It’s a must-not-miss destination! 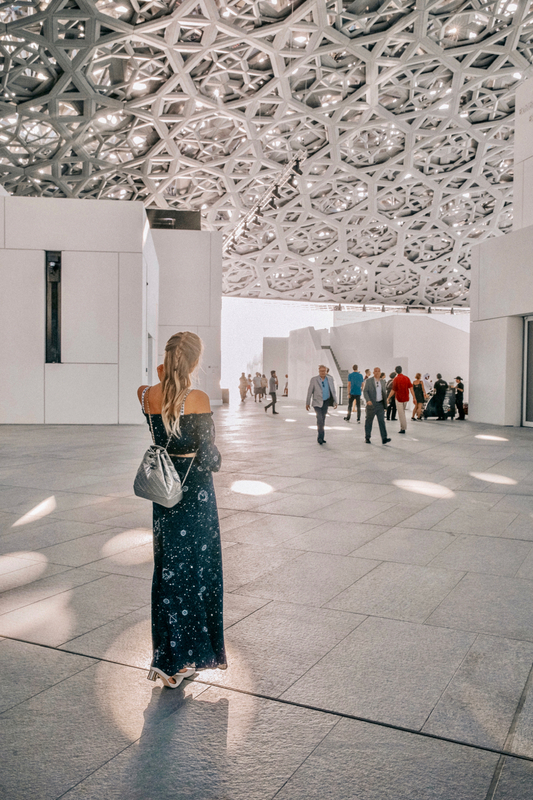 Opened on November the 11th, the Louvre Abu Dhabi has its name from Parisian one. Architect Jean Nouvel calls it his masterpiece, also due to the fact that it took quite a while to build it up, longer than actually planned. The exhibition shows a big variety of art from all over the world. The most amazing thing is that all these artpieces are placed up next to each other – as a unity of all nations and world religions. Another plus is the astonishing architecture: I loved how with the sun breaks through the building and creates wonderful light spots. 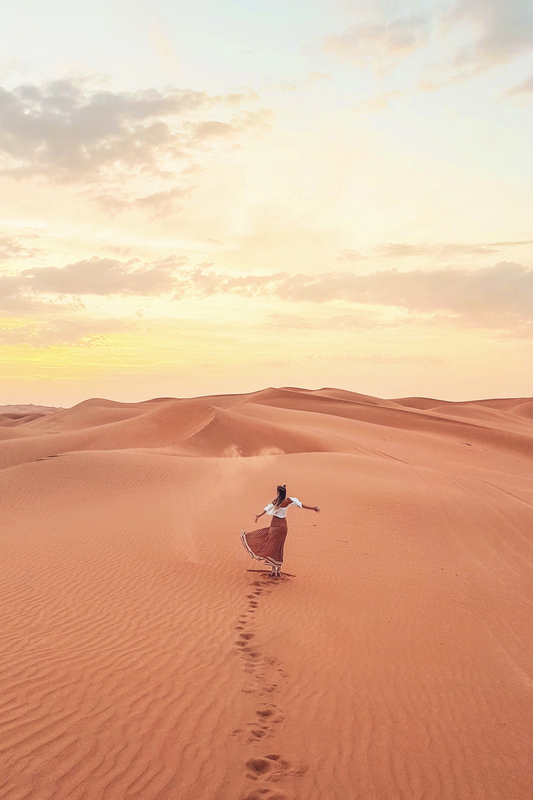 You simply cannot go to Abu Dhabi without a desert adventure! At least that’s how I feel! Even though I’ve been to the United Emirates a couple of times, I always have to return to the desert! Depending on how adventurous you are, there are quite a few fun options! 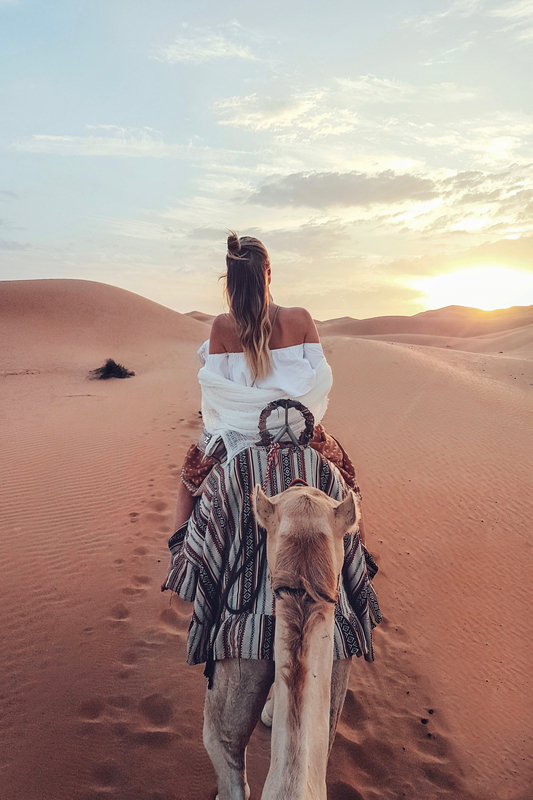 I love dune bashing, a traditional buffet – But my favorite thing is very simple: watching sunsets in the desert! The sun changes the colors of the sand and even after sunset you can see some of the most amazing star-spattered skies. While we stayed in the area next to the Grand Mosque out of view of the city’s skyscrapers, we went to the Observation Deck at 300 for afternoon tea one day. 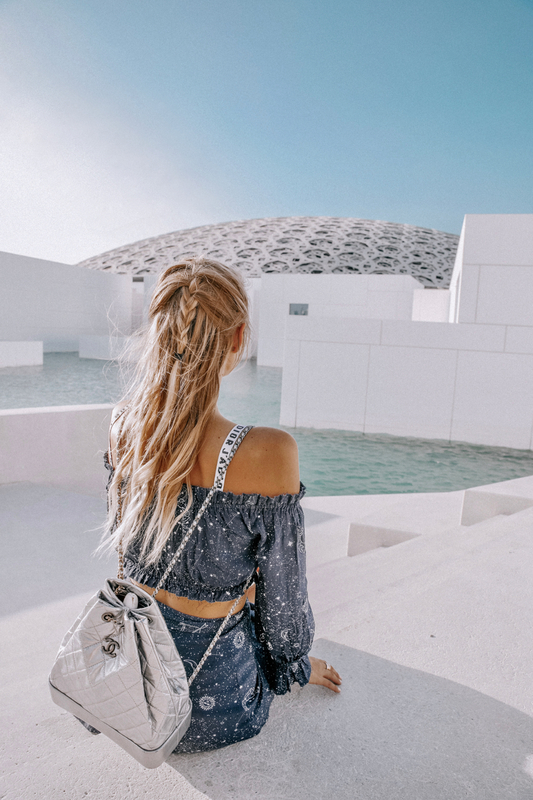 The observation deck is on the 74th floor of the Etihad Towers, which makes it the highest observation deck in Abu Dhabi and definitely worth the trip! While sipping a cup of tea or coffee or enjoying a snack you have the most amazing view on the skyscrapers next to you, the marina, the beach and both the Presidential Palace and the Emirates Palace (the first is a “proper” palace, the second one of the most luxurious hotels in the city – it’s probably not advised to knock on the wrong door when you booked a room at the Emirates ;)). 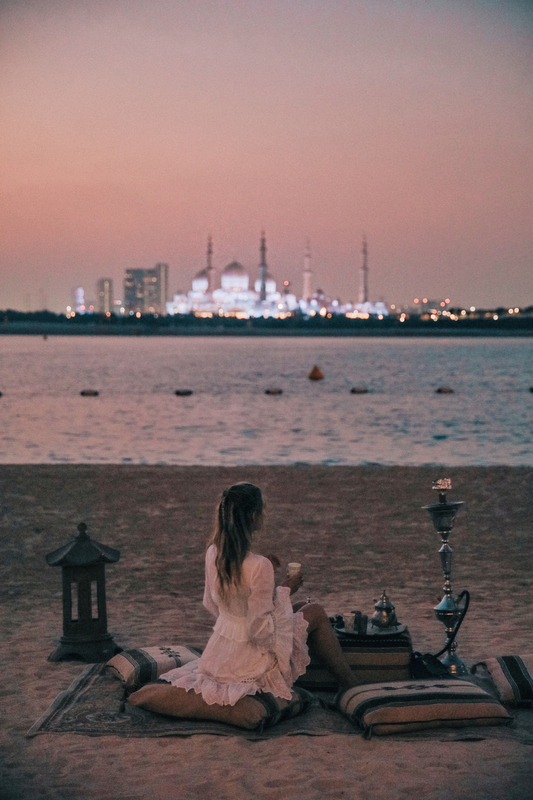 The Etihad Towers are also close to the Corniche Beach where you can sit in the sand and enjoy the Abu Dhabi skyline at the same time. 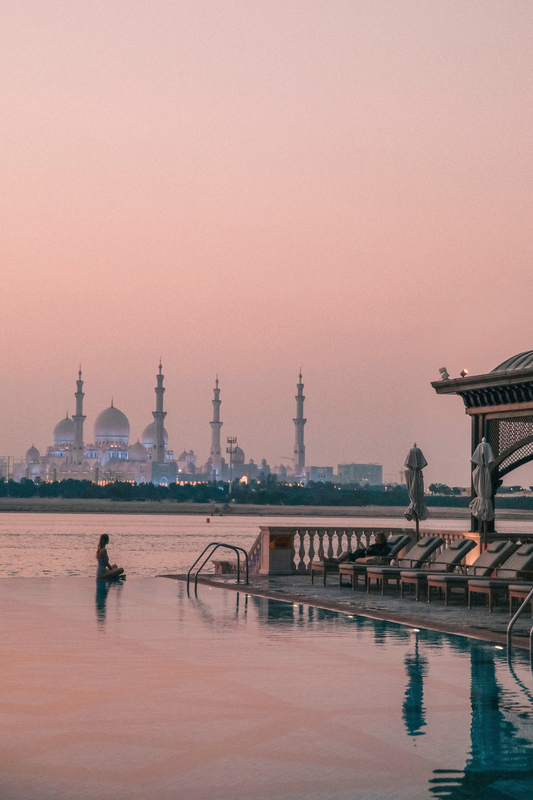 Abu Dhabi clearly is home to some of the most stunning hotels I’ve ever stayed at. The range of different types of hotels is just stunning! 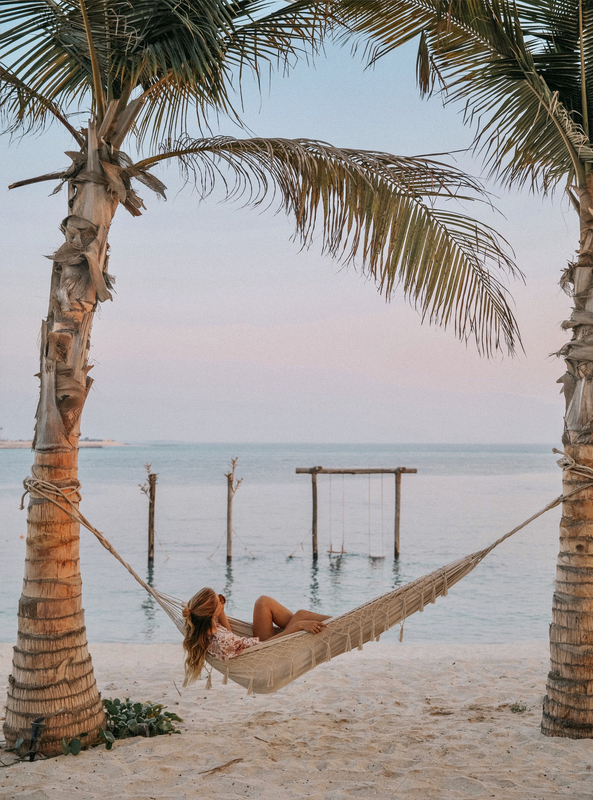 You can get instant Maldives vibes at the Zaya Nurai Island resort, a unique desert experience at Qasr Al Sarab Desert Resort by Anantara, the best Mosque views at the Shangri-La Hotel Qaryat Al Beri and the Ritz-Carlton Grand Canel or the most glamorous stay at the Emirates Palace. I did sooo much research before selecting my favorite hotels and even though there are countless options, the ones below are truly amazing in their own unique ways! 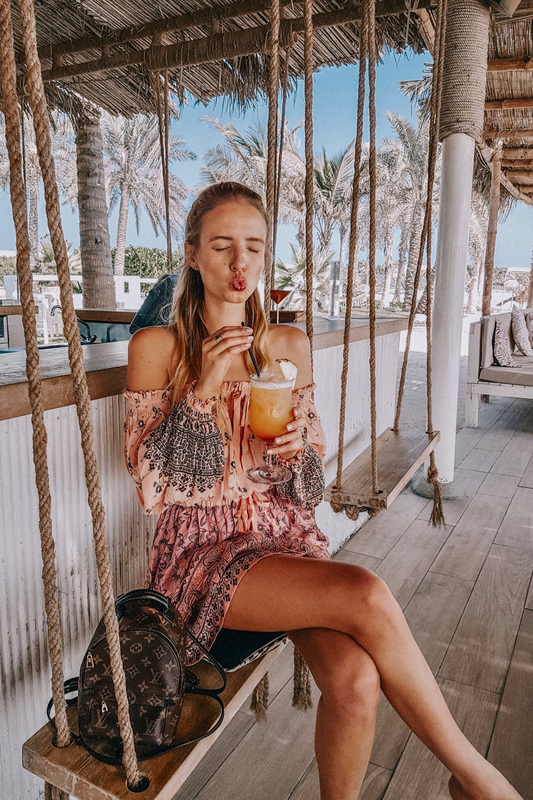 Sooo much to love about the Shangri-La Hotel Qaryat Al Beri! First of all the beautiful Mosque, the view at the beaches and around the pool area, the direct access to a little souk and boats which drive you along a small canal. Clearly one of my absolute favorites in Abu Dhabi (the evening has also been buffet is amazing! The dessert buffet is on another level ;)). 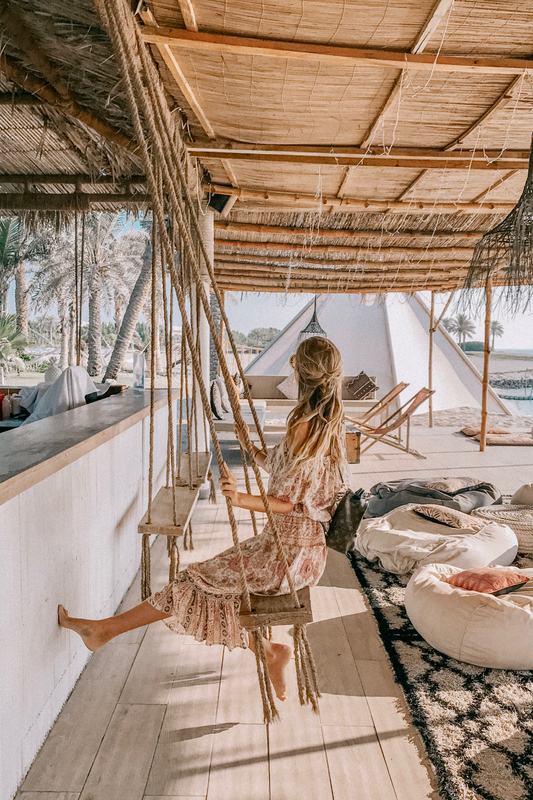 Maledive vibes in Abu Dhabi? When a small boat took us to the Zaya Nurai Island resort I couldn’t believe my eyes. 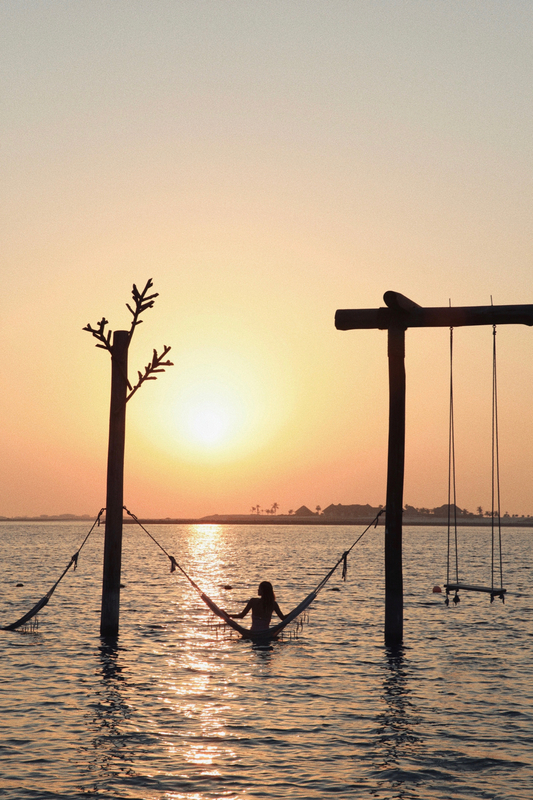 Turquoise water, super stylish villas and all the details of a cool boutique resort. 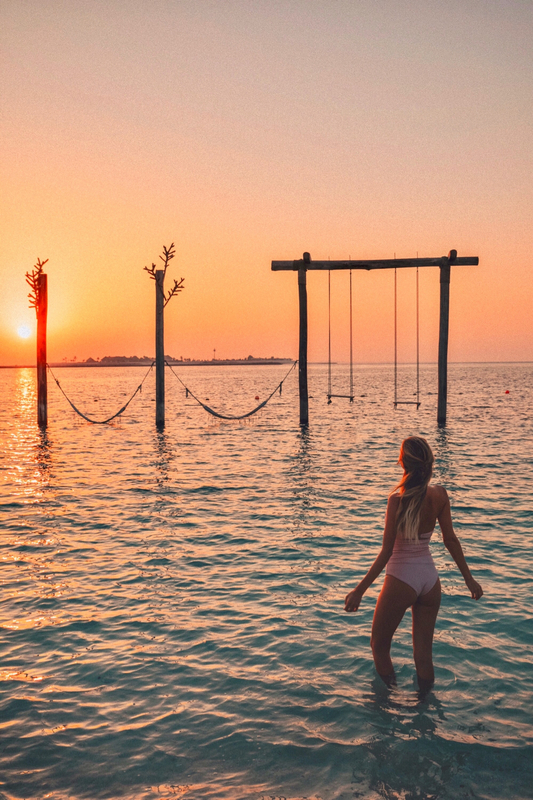 We only had one night at Zaya Nurai Island and it’s been unreal. We had a beautiful beach villa with private pool, super beautiful interior and cute bikes to cruise around the island. 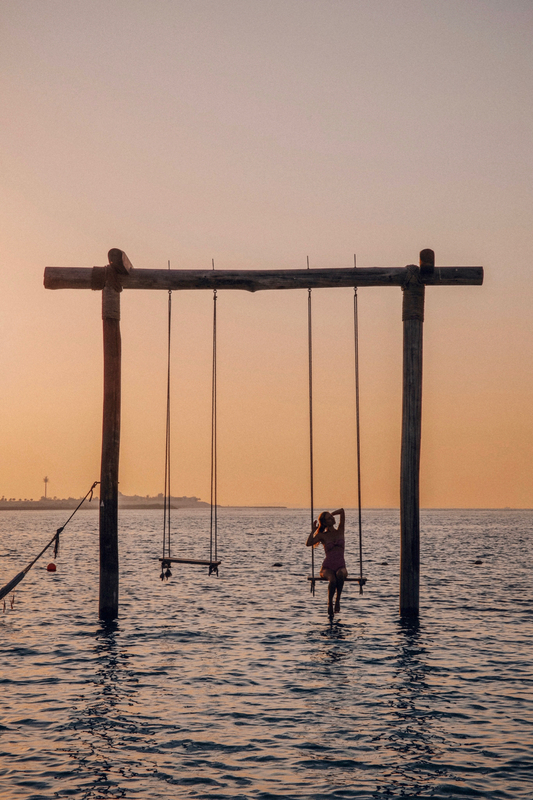 I loved the areas with swings and hammocks in the water and all colorful tippys at the beach. During our time in Abu Dhabi we stayed at the Ritz-Carlton Grand Canel. 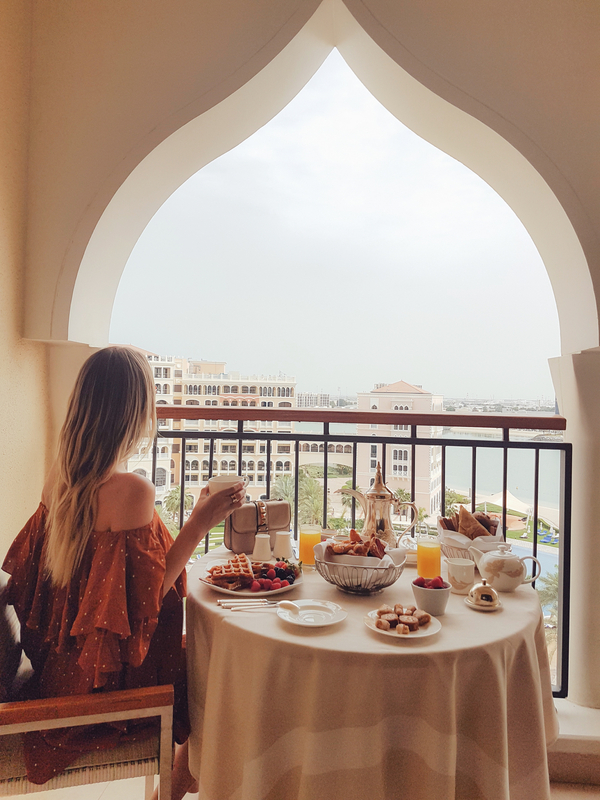 It is located next to the Grand Canal with a beach access but it also has an amazing view on the Sheikh Zayed Grand Mosque that is its direct neighbor. We changed rooms once so that we could enjoy both views from the bed for one night. And one night we had the most beautiful sunset behind the mosque that we enjoyed in the hotel’s garden. I love the Ritz-Carlton hotels and we have stayed there before (for example on Tenerife last month: here). Once more we had a very enjoyable stay and I can only recommend it especially because of its location next to the mosque that is in my opinion the most beautiful sight in the city! Oh my, everything looks so grandiose and magical!! Beautiful photo diary! That scenery is absolutely STUNNING. Especially the desert series! Beautifully put together Leonie. Beautiful photos! 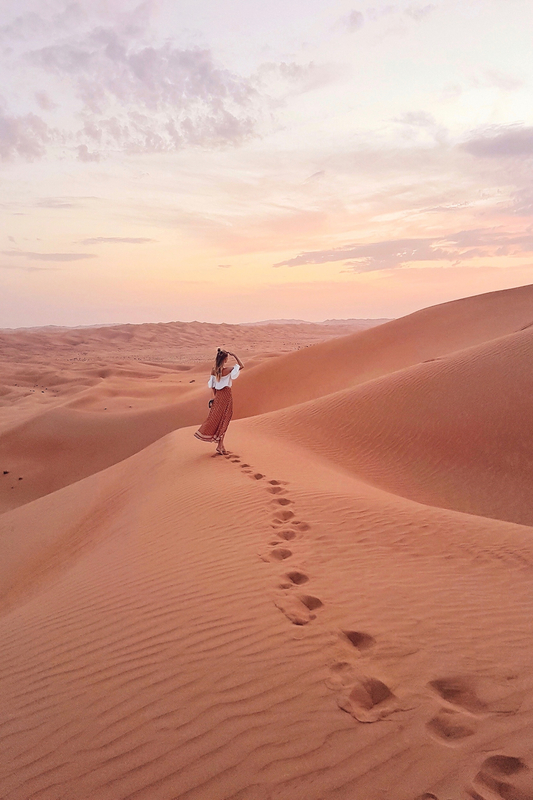 The UAE is such an incredible country, I love the diversity of the modern cities, the deserts and the beautiful crystal beaches all together in one place. 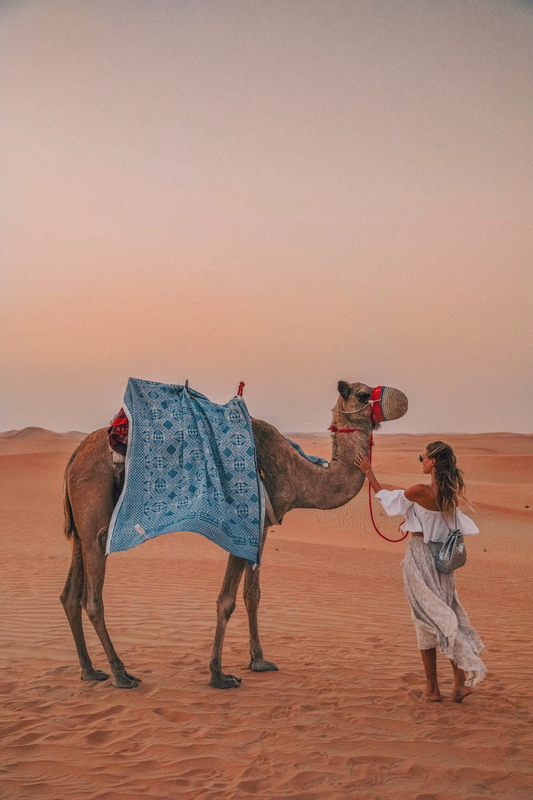 I too was in absolute awe of the resort I stayed at, completely surrounded by sand for miles and it was so magical to see camels wandering by! Wow, I would have never thought to go here had it not been for these photos! It looks so stunningly beautiful! I love the ones of you on the observation deck! 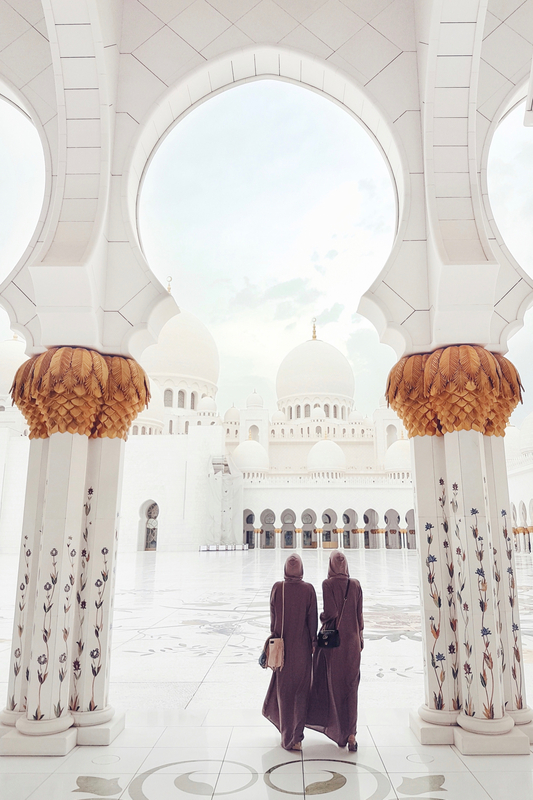 deine Bilder sind wie immer wunderschön und Abu Dhabi steht jetzt definitiv auch auf meiner Bucketliste 😀 die Wüstenbilder auf dem Kamel sind wirklich traumhaft ebenso wie die unglaubliche Moschee. Die möchte ich auf jeden Fall auch besuchen! Ich war leider noch nie in Abu Dhabi, aber deine Bilder machen auf jeden Fall Lust auf mehr! Super tolle Eindrücke! Liebsten Dank und noch ein schönes Wochenende meine Liebe! Also die Fotos in der Wüste sind definitiv meine Liebling. Sooooo schön. Ich war noch nie in der Wüste, das muss traumhaft sein. ok I want your life! Schön, dass der Beitrag dir Lust auf mehr gemacht hat! Das ist auf jeden Fall eine schöne Idee! Ich werde mal mit Alex darüber sprechen und gemeinsam überlegen! 🙂 Liebe Grüße zurück! I am glad you liked them that much! Abu Dhabi definitely has a lot to offer!! Wow Leonie deine Bilder sind immer sowas von auf dem Punkt! Wirklich wunderschöne Aufnahmen. Deine Outfits sind super stimmig mit der jeweiligen Location. Ich kann mir deinen Blog stundenlang anschauen und habe immer noch nicht genug! I would love to visit there some day! The mosque is absolutely jaw dropping. I visited Dubai 2 years ago, but unfortunately missed this spot. Yes, it is such an amazing and unique building!! Wow was für beeindruckend schöne Fotos. Ich will schon lange unbedingt in die VAE. Ich hoffe es dauert nicht mehr allzu lange. The mosque looks so gorgeous! 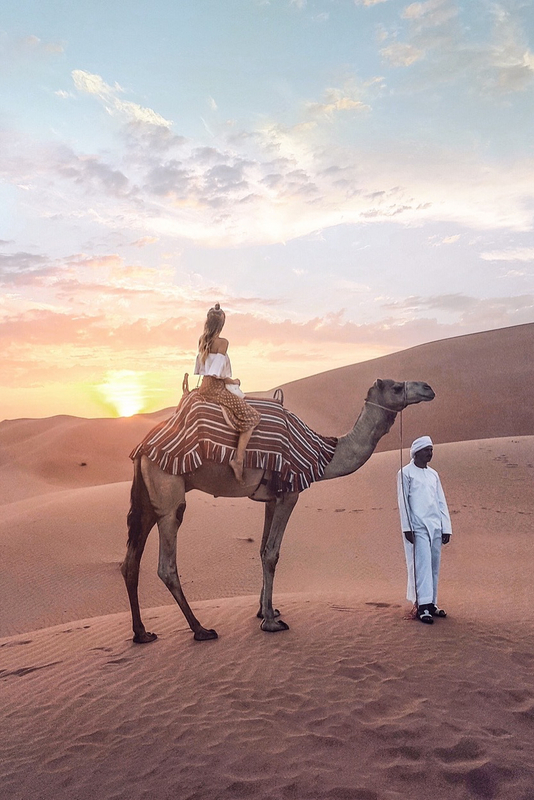 I am soooo obsessed with these photos and this destination!! What a magical place! Wow! Ich muss jetzt unbedingt dahin. Hatte Abu Dhabi sonst nie so in Erwägung gezogen, aber deine traumhaften Bilder sind wirklich überzeugend. Danke für die Inspiration, Leonie! Freut mich, dass sie dir so gefallen haben!! You are living a dream life. All of the photos are fascinating. Definitely have Abu Dhabi on my mind now! 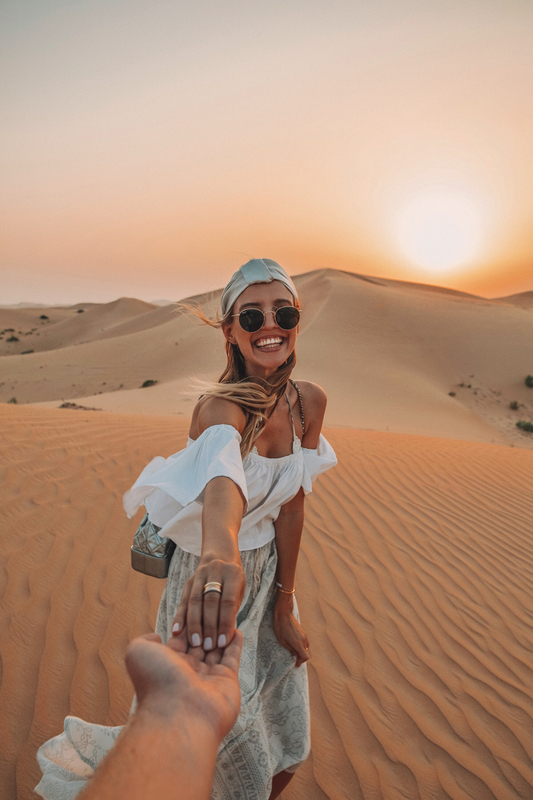 Bucket list item for sure 🙂 Your photos turned out beautifully as always Leonie! That is Beautiful! Definitely one of the next on my list! Hello, I have a request for all you people with a good will. My friend is celebrateing her birthday, so I want to make a surprise for her. I have imagined this surprise as a lots of people, from different states and cities, taking a picture of a papper on which is written ”Happy birthday, Nataša” and below with the name of the city where picture was taken. It would be nice if there was also a panorama of the city or some recognition mark of the town. If someone really wants to help me with this project, please send me pictures at my email adress marijanadrobnjakovic@gmail.com. Thank you. 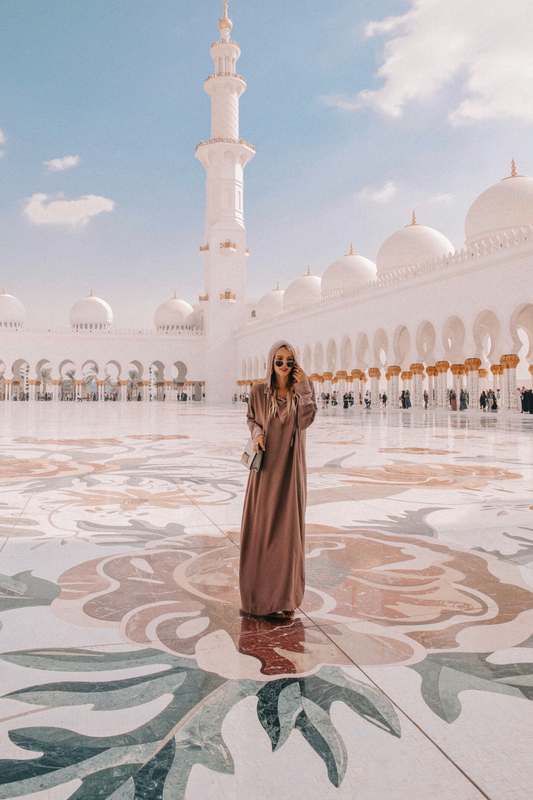 Hi, I was wondering what was the dress code for the mosque in Abu dhabi? Hi! I love this post! Traveling to Dubai and Abu Dhabi in January! Where did you find that gorgeous outfit for the mosque? Amazing post! Such an inspiration love! Espectaculares las fotos, los sitios y los looks divinamente escogidos. wanted to give a quick shout out and tell you I really enjoy reading your blog posts. <3<3<3 Thank you so much! Hello your pics are gorgeous!! What camera and editing software do you use?? Detailed about all Abu Dhabi things to do. very informative. thank you. Hey deine Bilder sind wirklich schön! Wir wollen im September auch nach Abu dhabi. Aber verstoßen deine Outfits nicht alle gegen die Kleiderordnung, die man aus Respekt den Einheimischen gegenüber einhalten sollte? Soweit ich mich informiert habe gilt “Schulter und Knie bedeckt” oder nicht?